Jessica Dimuzio, VMD, is a veterinarian who has worn many hats in her pursuit of preservation of wildlife and their habitats: field researcher, conservation educator, nonfiction children’s book author, and now filmmaker. In 2006, she wrote a poem describing all the sights and sounds of the African savannah, based on her experience living in a tent on Maasai land in Kenya, East Africa. Her dreaming of all the animals she heard during her day, from the dove that woke her each morning to the wildebeests that lulled her to sleep, became her African Animals’ Lullaby. Although Dimuzio wrote and published two other award-winning children’s picture books, Bark! Bark! Bark for My Park! and Bow Wow Wow! Green Beans Now?, African Animals’ Lullaby needed the animal sounds to accompany the text so this manuscript was set aside until serendipity intervened. Last year the film was a finalist at the Cut-to-the-Chase Film Festival, W. Virginia and in March 2019 was screened as part of the Women’s Film Festival of Philadelphia. Latest news is that The Women’s Film Festival posted the winners of the Juror Awards and African Animals’ Lullaby was one of them! What’s next? 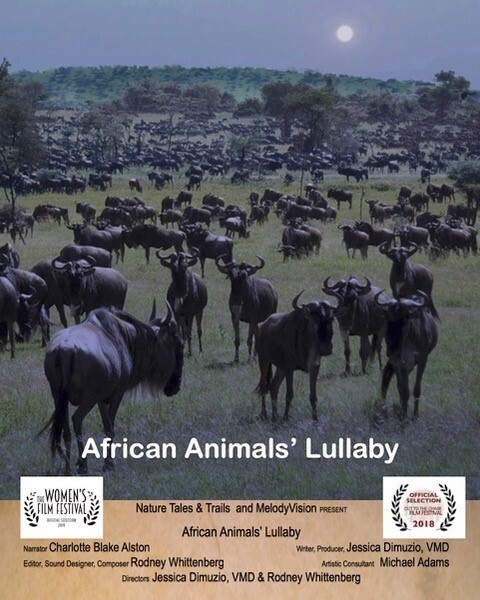 Submission to festivals is ongoing so African Animals’ Lullaby is not yet available on-demand or for sale, but one can request a program which includes a screening from Dimuzio’s company (www.naturetalesandtrails.com). “Rodney and I learned so much from each other and had so much fun we are already discussing the next film!” Dimuzio is returning to East Africa later this year to meet her foster baby elephants in Kenya and to revisit the gorillas in Uganda. Maybe this time she will be able to articulate the feeling of peace from being in the presence of gorillas into another film.